Storyline 360 uses a hierarchical structure of scenes, slides, and layers to organize content. Scenes are the largest organizational units. Each scene contains one or more slides. And each slide can have multiple layers. Story View gives you a big-picture view of your entire project. It's where you manage scenes and the layout of your course. Storyline initially opens in Story View. At any time thereafter, you can switch to Story View by clicking the Story View button in the lower right corner of the screen (near the zoom slider). Another option is to go to the View tab on the Storyline ribbon and click Story View. If you're in Slide View, you can also click the Story View tab just below the Storyline ribbon. Every Storyline project has at least one scene. Story View is where you manage scenes, including adding scenes, deleting scenes, and rearranging the slides that appear in those scenes. Select the scene, go to the Home tab on the ribbon, and click Starting Scene. Right-click the scene and choose Starting Scene. Go to the Home tab on the ribbon and click New Scene. Right-click anywhere in the workspace and choose New Scene. Duplicate an existing scene (and all its slides) by selecting the scene and pressing Ctrl+D, or by right-clicking the scene and choosing Duplicate. Double-click the title to open it for editing, type the new name, and press Enter on your keyboard. Right-click the scene and choose Rename. Type the new name and press Enter on your keyboard. Storyline displays scene titles in your course menu. You can remove and rename scene titles in the menu without affecting the scenes in Story View. See this tutorial for details. Select the scene and press Delete on your keyboard. Right-click the scene and choose Delete. By default, Story View displays a thumbnail image for every slide in your course. If you have a large course with lots of slides, it can be helpful to collapse scenes to get a better picture of your course layout. To collapse a scene, click the triangle in the upper right corner of the scene. To collapse all scenes at once, right-click anywhere in the workspace and choose Collapse All Scenes. To expand a scene, click the triangle in the upper right corner of the scene. To expand all scenes at once, right-click anywhere in the workspace and choose Expand All Scenes. You can move slides from one scene to another to better organise your content and change navigation. Just select one or more slides in a scene, then drag them to a different scene. In Story View, lines and arrows indicate the relationship between slides and scenes. Use triggers to customise navigation and create branched scenarios. See the section on changing the navigation order later in this tutorial for details. Most of the work involved in building slides will be done in Slide View, but Story View is great for organising slides, adjusting slide properties, and controlling navigation. Go to the Home tab on the ribbon, click New Slide, and choose a slide type. Go to the Slides tab and choose a slide type. Right-click the scene, scroll to New Slide, and choose a slide type. Duplicate an existing slide by going to the Home tab and clicking Duplicate. Go to the Home tab and click Record Screen to insert a screencast. 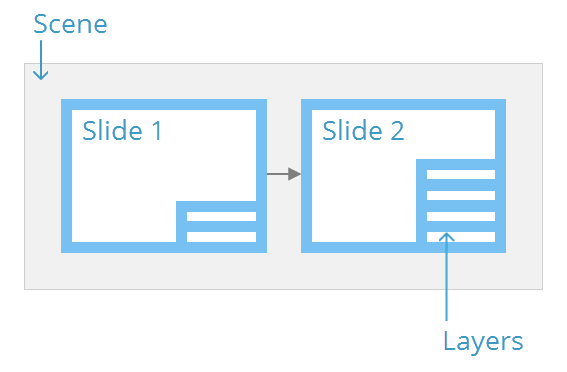 To learn more about the different types of slides you can create, see Adding New Slides. Right-click the slide and choose Rename. Type the new name and press Enter on your keyboard. Storyline displays slide titles in your course menu. You can remove and rename slide titles in the menu without affecting the text on the slides or the slide titles in Story View. See this tutorial for details. To rearrange slides, just click and drag them to a new location. When you drag a slide, a small blue arrow will show you where the slide will be inserted. Release your mouse button to drop it into place. You can also use Shift+Click and Ctrl+Click to select multiple slides at the same time to move them as a group. Slides can be rearranged within the same scene or moved to different scenes. For most slide-specific tasks, you'll switch to Slide View, but some edits can be made in Story View. Right-click any slide, scroll to Apply Layout, and choose a layout. Or, go to the Home tab on the ribbon, click Apply Layout, and choose a layout. Learn more about slide masters and layouts. If you've modified elements of a slide that are inherited from its master layout, you can always revert back to the original layout. Right-click the slide and choose Reset Slide, or go to the Home tab on the ribbon and click Reset. Right-click a slide and choose Format Background to add a different fill to the slide's background. Another option is to go to the Design tab on the ribbon and click Background Styles, then right-click one of the styles to apply it to the selected slide(s). Learn more about background designs. Design themes are a quick way to change the background, colors, and fonts throughout your course. Go to the Design tab on the ribbon, right-click any theme, and apply it to the selected slide(s). Select a slide, go to the Transitions tab, and choose a transition from the gallery. If the Effect Options button becomes active, it means you can modify the slide transition by choosing an effect from the drop-down. Learn more about slide transitions. Triggers tell Storyline how to respond when learners interact with your course. Select a slide and use the Triggers panel to add, edit, and delete triggers. Use the Slide Properties panel in the lower right corner to change how slides advance, how they behave when revisiting them, and which player controls they display. Learn more about slide properties. Right-click any slide, then choose Duplicate, Rename, or Delete. By default, scenes and slides follow a linear order, but you can add branching with triggers. To branch from one scene to another, click the chain link icon at the bottom of the scene, then choose Link to Slide or Link to Scene. To branch from one slide to another, select the slide and double-click the Jump to next slide trigger in the Triggers panel. When the Trigger Wizard appears, select the slide to which you want to branch and click OK.
A question bank is a group of questions from which you draw slides to create dynamic quizzes throughout your course. A question draw is a special slide in your course that pulls questions from a bank when the learner reaches the slide. A question draw can be a subset of questions from a bank or an entire bank, and it can even be randomised. To manage question banks in Story View, go to the Home tab on the ribbon and click Question Banks. You can create a new draw from a question bank, create a new question bank, or manage existing question banks. Existing question banks will also be listed by name. Every project has one question bank by default, called Question Bank 1, but you can add more. For details, see the user guides about managing question banks and question draws. Tip: You don't have to use question banks to create quizzes. If you prefer, you can add individual question slides directly to your course just like other slides. See Adding Form-Based Questions and Adding Freeform Questions. Here's a helpful tip: You can undock panels and move them to another monitor if you need more room to work. Just click the title of a panel—such as Triggers or Slide Properties—and drag it to a new location. To redock all panels at the same time, go to the View tab on the ribbon and click Redock All Windows. To learn more about working with the Storyline interface, see this user guide.